Now this is a film I really can't wait to see again. 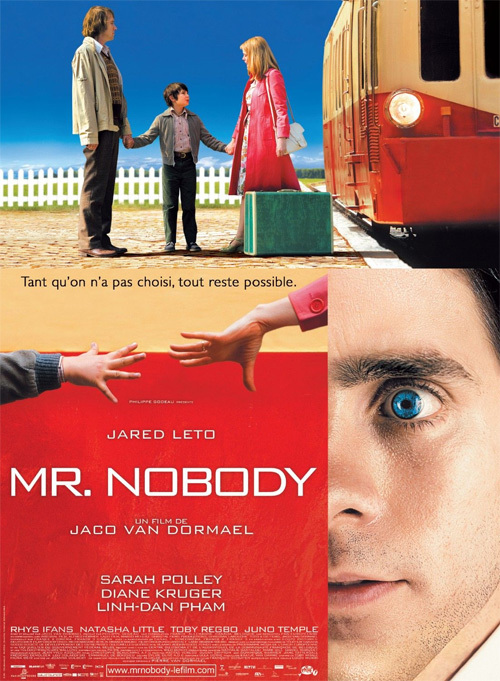 Mr. Nobody is a French sci-fi drama starring Jared Leto, Rhys Ifans, Sarah Polley, and Diane Kruger. This new French poster comes from our friends at IMPAwards. I'm featuring it not necessarily because I like the design, but rather because it's a film I'm happy to put in the spotlight. I finally got to see it at the Toronto Film Festival a couple months ago and quite enjoyed it. It's got some flaws and problems, but overall it's a fascinating film about love and how one decision can change so much of your life forever. It's a very interesting concept to see on film. Anyway, take a look at it below. We also featured an early trailer for Mr. Nobody back in May that I suggest everyone also watch right here! Nemo Nobody (Jared Leto) leads an ordinary existence at his wife's side, Elise, and their three children until the day when reality skids and he wakes up as an old man in the year 2092. At 120, Mr. Nobody is both the oldest man in the world and the last mortal of a new mankind where nobody dies anymore. Mr. Nobody is both written and directed by veteran Belgian filmmaker Jaco van Dormael, of Totò the Hero, Lumière and Company, and The Eighth Day previously. The film was shot in both Germany and Canada throughout 2007, but is only now just being unveiled. Despite showing at numerous festivals, Mr. Nobody does not have a US distributor yet, but we'll let you know when we hear more about its potential US release. Saw it at the film festival as well. Wish people had asked the director better questions. Good film regardless. nice poster, but that shot of jared leto on the right-bottom corner reminds a lot of "requiem for a dream" (which is not essentially a bad thing, but it kinda takes the originality away). and the tagline which roughly translates as "if we don't chose, everything is possible" is quite good.